Bucilla ~ Santa’s Sweet Shop ~ 43″ Felt Christmas Tree Skirt Kit. 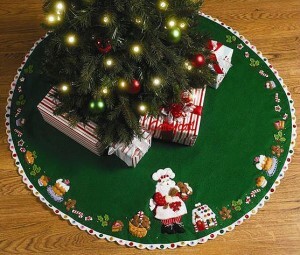 This Yummy Tree Skirt kit features a smiling Santa all decked out in his best Chef Hat and apron as he puts the finishing touches on some of the many sweet goodies that are sprinkled all around the outside edge of the tree skirt. 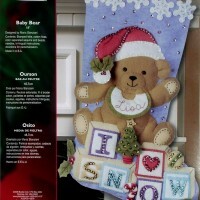 This pattern is bound to catch the attention of anyone with a sweet tooth who appreciates all the traditional Christmas treats from the adorable little Gingerbread house to the mouth-watering cakes and cookies. 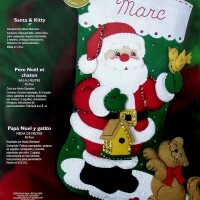 This pattern is also available in a matching Stocking, and Ornament Set. 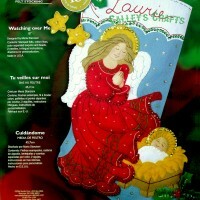 Please check my other listings for the matching kits.